I know most people fall into one of two camps when it comes to Brussels sprouts: love or hate. I’m in the love camp and I eat them in most any form. I know when they are overcooked or underseasoned it’s easy to not be excited about them, but if they are well-prepared, I really don’t understand hating on them. This recipe makes the case for those of us who love them. I admit I have an advantage in that I was raised in a family of vegetable eaters and I really do love most all vegetables. Lately, I’ve been on a raw Brussels sprouts kick using them in place of cabbage for coleslaw with carrots, onions, radishes, and mayonnaise. 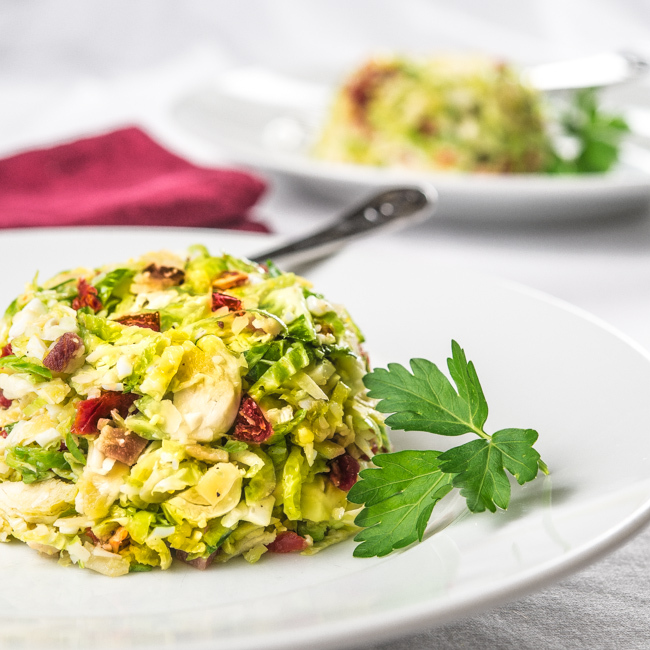 I recently went to an Atlanta restaurant and had a delightful Brussels sprouts salad, similar to this recipe. I’d liberally modified the ingredients and came up with this salad that I would challenge even the most ardent Brussels sprouts haters to try. After all, doesn’t bacon make anything enjoyable, even Brussels sprouts? And add some Pecorino Romano cheese, sun-dried tomatoes, and a lemon vinaigrette and what’s not to love? This salad makes an elegant and healthy addition to any dinner party and keeps well for a day or so in the refrigerator so you can make it ahead of time. Prepare the sprouts by hand by trimming off the stem end, placing the cut side down on a cutting board, and thinly slicing them with a knife. If you have a food processor with a slicer attachment, the process goes much more quickly. If you love Brussels spouts by all means try this salad. If you are not so crazy about them, have an open mind and consider trying this recipe. I’m crazy about this salad and I think you might be too. In a small bowl, whisk together lemon juice, mustard, honey, salt, and pepper until well combined. While continuing to whisk, slowly drizzle oil into bowl. Continue whisking until oil is incorporated into the dressing. Combine all ingredients and dress with lemon vinaigrette to taste. I’m a Brussels Sprout lover in the first place, but this dish was just wonderful! Thanks so much Bill for bringing them today!! Can’t wait to try this one for myself. Thanks so much, Tom! So glad you enjoyed it! This looks delish. Need to try this one. And great photos too, btw. I have never been a fan of brussel sprouts but you are seriously making me rethink that! I’m definitely in the love camp for Brussels sprouts, too — this looks right up my alley, what with the addition of BACON and all. Nicely done, Bill! I’m in the camp that loves Brussels sprouts, thank goodness. And they combine so well with bacon, don’t they? Of course what doesn’t combine well with bacon! This is a great dish. Terrific food styling. Thanks. I fall into the “dislike” camp simply because I think there is a chemical reaction that is not pleasant in my mouth (it smells like gasoline to me!). However, I am very open-minded and your recipes are wonderful. I administer a recipe group on Facebook and will share this recipe with group members today! Thanks for presenting beautiful recipes…very approachable and (in most case) very edible.